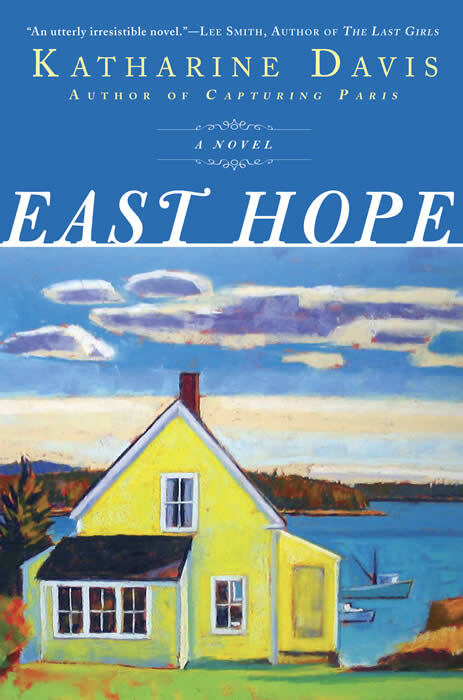 Caroline Waverly, my female protagonist in East Hope is a food writer. Early in the novel, after moving to Maine, she makes fish chowder for her friend, Vivien, who has come to visit. They eat the soup in the airy dining room in the lovely old house that Caroline has inherited. Vivien comments on the freshness of the fish, the beautiful view, and the charming village of East Hope. Meanwhile, Caroline can barely swallow her soup as she tries to gather the courage to tell her friend the news that will change her life completely. Chowder is a thick soup made of clams, fish, or shellfish with either a milk or tomato base. Manhattan clam chowder has a tomato base, but chowders containing milk or cream are particularly popular in New England. This recipe is from Mary, the youngest of my two sisters. We have a habit in our family of referring to ourselves with the title, “sister,” as in “Sister Mary’s on the phone,” or “When is Sister Carroll arriving?” Thus – Sister Mary’s Fish Chowder. “Sister” Mary, who has lived in Maine for over 30 years and is still considered to be “from away” as she was not born in the state, makes a “wicked good” chowder. She is a natural cook and, after experimenting with recipes, comes up with her own version of a dish that is always delicious. Mary adds a can of creamed corn to the soup for the additional creaminess and layer of flavor. This chowder is perfect on a cold Maine evening, or for lunch when the fog just won’t lift. It is delicious, simple to prepare, and the perfect soup any time you are in the mood for chowder. I’ve also included my favorite corn bread recipe. 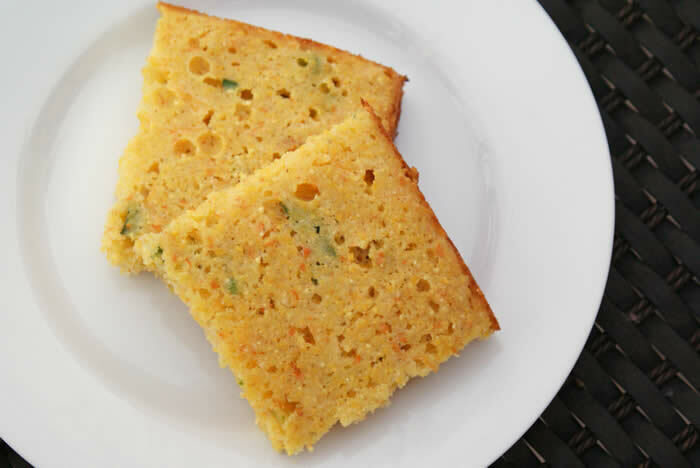 This cornbread is almost like cake and I’ve had guests fighting over the last piece! 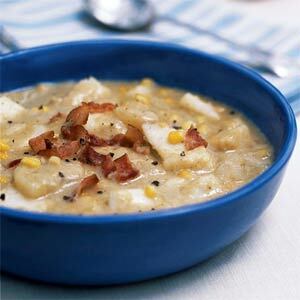 Sister Mary’s Fish Chowder, cornbread, and a green salad are a wonderful combination – perfect for a hearty supper. Cut bacon in 1/2-inch pieces and cook in a soup pot over medium heat until crisp. Remove with slotted spoon and blot on paper towels. Pour off all but 2 tablespoons fat from the pot. In the same pot, sauté the onion and celery over medium heat until they start to soften. Add wine and thyme. Cook for 1 minute on medium-high heat. In a steamer, steam the potatoes for approximately 10-15 minutes, until tender, and set aside. Add the clam juice, half and half, fish, scallops if using, and salt and pepper to taste. Add additional water if needed to cover fish. Simmer 10-15 minutes at medium heat until fish is cooked through. Do not boil. Add creamed corn and potatoes and heat through. Adjust seasonings. Top individual servings with bacon bits. 1. Preheat oven to 350 degrees. Grease an 8 x 12 x 2 inch pan. 2. In a large mixing bowl, combine the butter, sugar, eggs, chilies, corn, and cheeses. Sift the flour, cornmeal, baking powder, and salt and add to the egg mixture. Stir until thoroughly combined. 3. Pour batter into the prepared pan. Lower the oven temperature to 300 degrees and bake for 1 hour. Serve warm or at room temperature.